We have been eating triangles of watermelon day after day around here. It's something I never get tired of. 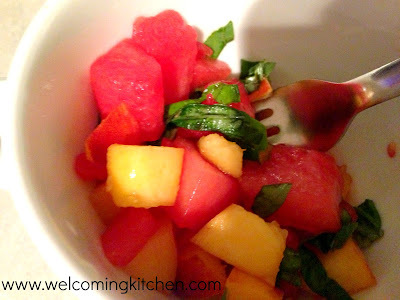 Even so, I as delighted when my friend Julie served up this beautiful watermelon salad. With basil and lime juice, this salad is a little more sophisticated, but just as refreshing! Combine lime juice and agave nectar in a large bowl. Add other ingredients and stir to combine. I like the idea of something so simple like watermelon and adding just a little something that makes it into an entirely new and different dish. I can see how watermelon would work really well with basil!